A permanent resident of the Gowanus, the Panama Loujaine has forsaken her days of transatlantic voyage for retirement at the mouth of the canal. 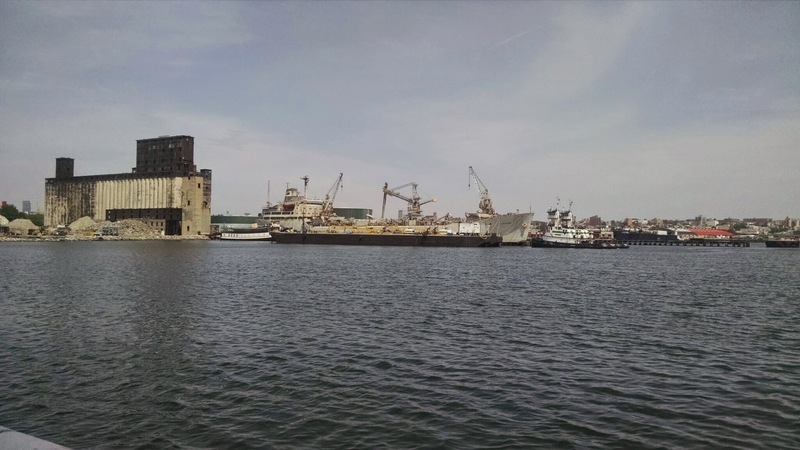 Not nearly as visible in the skyline as her neighbor, the Red Hook Grain Terminal, the Loujaine is often assumed abandoned by the few who do notice her, “a hidden treasure” in the harbor. But she’s currently utilized as a non-mobile floating storage hulk for cement products and cranes, and is managed by John Quadrozzi, the same man who owns the Grain Terminal. Loujaine’s former life was as a cement and dry cargo ship. Built in 1966 in Nagoya, Japan for the Saudi Arabian company Arabian Bulk Trade (ABT), Loujaine was originally named Bahma. ABT’s logo, green stripes and a white center with the silhouette of a running jaguar, is still visible on her funnel. In 1985 the ship lost its certification, was re-acquired by ABT and converted for cement handling. ABT renamed her the “Abu Loujaine,” and it arrived in Brooklyn shortly after. Today she’s known only as the Loujaine and sports the Panama flag. Loujaine’s made guest appearances in Lorde and David Bowie music videos and, unlike her crumbling neighbor, is kept active and in usable shape as a reminder of the canal’s industrial past. Hannah Frishberg is a 5th generation Brooklynite. Earlier she explored Red Hook’s giant grain elevator and Fort Tilden’s recent ruins.